Watch Students for Sustainability interpret your favorite movies! On Tuesday, February 18, representatives from CL&P hosted an energy summit at the Nathan Hale Inn to collaborate with UConn’s energy employees as well as members from other departments and determine next steps for the University’s energy goals. The summit started off with a recap of what UConn is currently working on and what successes the University has accomplished thus far. For example, in the past three years UConn has prevented 39,370 tons of coal and 117,985 barrels of oil from being burned. Additionally, we were ranked #1 in 2013 for Sierra Club’s Cool Schools Survey. Going forward UConn plans to mitigate the impact of a growing university through behavior change in the community, retrocommissioning of old buildings, and making sure that all new buildings are as energy efficient as possible. CL&P invited Walt Henry, a former professor at MIT and current energy consultant to share his experiences at MIT with UConn. According to Henry, an energy efficient building does not have to cost more than a standard building. “A building is like a cake,” he said “the ingredients in the cake itself are what’s most important, not the frosting and cherry.” What he means by this is that all you need to do in order to make an energy efficient building within budget is to spend your money in the right places. Instead of focusing on fancy extras that may seem important, you should focus on using the right materials in the right places. For example, instead of spending money on limestone, use cast stone. It is less expensive and works just as well. You should however invest the money on good spray foam insulation and windows since air tight walls increase efficiency. Henry ended his presentation with some key take-aways that may help UConn when making the designs for new buildings. For one thing, architects and engineers must collaborate so that the structure of the building and the internals work together. Also it is important to take intelligent risks, knowing what could possibly go wrong, but not being afraid to be a leader in sustainable building. Finally, Henry noted his opinion on how LEED (Leadership in Energy and Environmental Design-a current ranking system for many green buildings) should not drive the design of a new building. The planners should make the best building they can and then use LEED as a yardstick. This way, they have the chance to be innovative and possibly even make a better building than LEED calls for. Going forward, UConn still has many things to consider and there is always room for improvement. However, meetings like this increase collaboration among UConn departments, our partner CL&P, and other universities to help turn the best ideas into reality one step at a time. Katie’s pumped for Green Game Day! Is everyone ready for Green Game Day this Saturday??? I certainly hope so! So, what can you do to make the most of this year’s football Green Game Day? Start your game experience right at home by packing only reusable and recyclable materials for your tailgating party. When you arrive at the game keep an eye out for EcoHusky and EcoHouse volunteers who will be promoting eco-friendly behavior and collecting recyclables from fans. 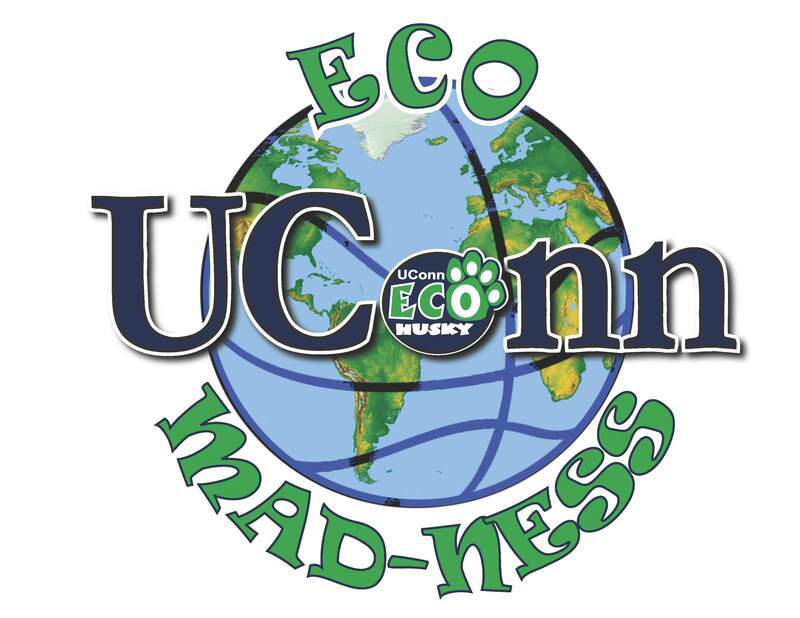 If you’ve got a minute between barbecuing and swapping stories with fellow fans, take a walk over to the Fanfest area where more volunteers will be waiting to educate you about UConn’s green initiatives (there are even some fun giveaways! Honestly, who doesn’t like free stuff?) During the game keep an eye and ear open for any messages that will let you know all of the great ways that Rentschler field is going green. My experiences at past Green Game Days (GGDs) have always left me with a positive feeling. At Rentschler, I’ve gotten the chance to both collect recyclables from tailgaters and work the booth, both of which I found to be rewarding experiences. I was so encouraged by how fans were completely on board with our efforts and gladly handed over their empties for recycling. Several fans even wanted to know more about our mission and I was happy to give them a little insight into the efforts of the OEP and our affiliated student groups. At the booth I thought it was great educating fans of all ages and interacting with them through fun little games and just general conversation. I have also had the opportunity to orchestrate two Basketball GGDs and I would just like all the fans to know, it takes a lot of work! I sincerely hope that everything we do behind this scenes pays off and that you as fans feel like the green message has shown through and encourages you to be more eco-friendly in your endeavors even after you leave the game. So gear up, get pumped, and get ready to recycle! Attention UConn commuters! This year, parking services is offering a carpooling program available to commuter students at the University of Connecticut. The aim of the program is to encourage students to reduce their carbon footprint with the incentives of saving gas and money by riding to school together. Carpooling is also a great way to save some money on your parking pass! The final results on EcoMadness 2012 are in! Throughout the competition, Buckley has held the number one spot for lowest daily per capita usage of energy, at 3.7 kWh per student per day. 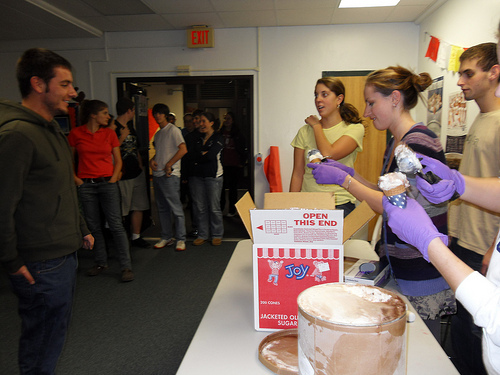 Their hard work and dedication kept them in the lead, and as a reward they will have a free UConn Dairy Bar ice cream party in addition to bragging rights! In the energy reduction category, Sherman/Webster of Towers held the lead for three weeks. However, during our double or nothing final week of competition, Whitney scrambled ahead in the final moments! They had held a top three position throughout the competition, but Whitney beat out Sherman/Webster by a slim 0.03% finishing for a 20.5% total reduction in energy consumption. Of the 23 participating dorms, 21 successfully reduced their energy consumption by a total average of 8.5%. The average per capita use was 4.4 kWh per day. Sprague, the new home of EcoHouse, was the clear winner for water reduction with an incredible final reduction of 21.0%! For some perspective on what a major accomplishment this was, the second place dorm reduced by 13.0%. Since the second week of competition, Sprague held its leading spot with steady improvements each week. Another winner who held their position consistently throughout EcoMadness was Hamilton/Wade/Fenwick/Keller of Towers with an average per capita consumption of 32.0 gallons of water per day throughout the course of the competition. Congratulations to all the dorms that successfully reduced their water and/or energy consumption during the course of EcoMadness. Keep up the good work and remember to keep conserving!